When I got these jeans, I loved how they fit, however they were a bit long, so I shortened them. Then after a few wears, I noticed that they stretched out considerably, but they were so comfortable I slimmed them through the legs a little. Still not satisfied, I shortened them even more, and took them in from knee to ankle, but I wonder if there is still room for improvement? 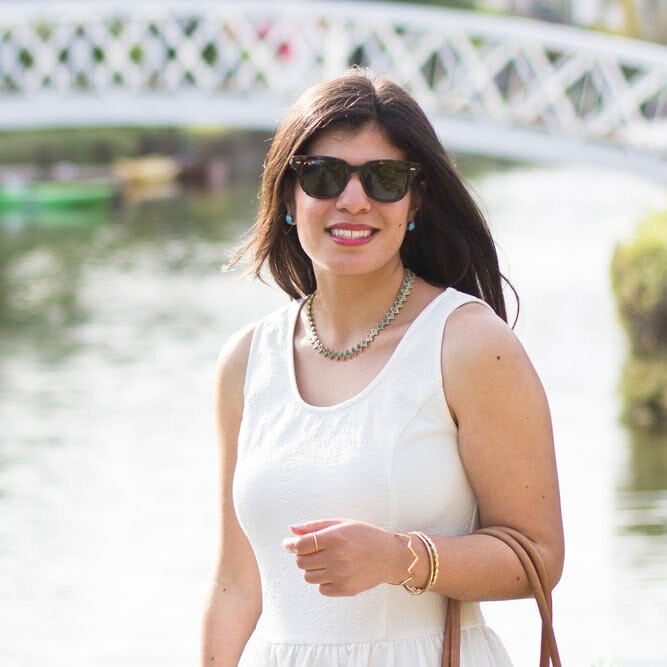 Have you entered my $100 Lumo jewelry giveaway yet? 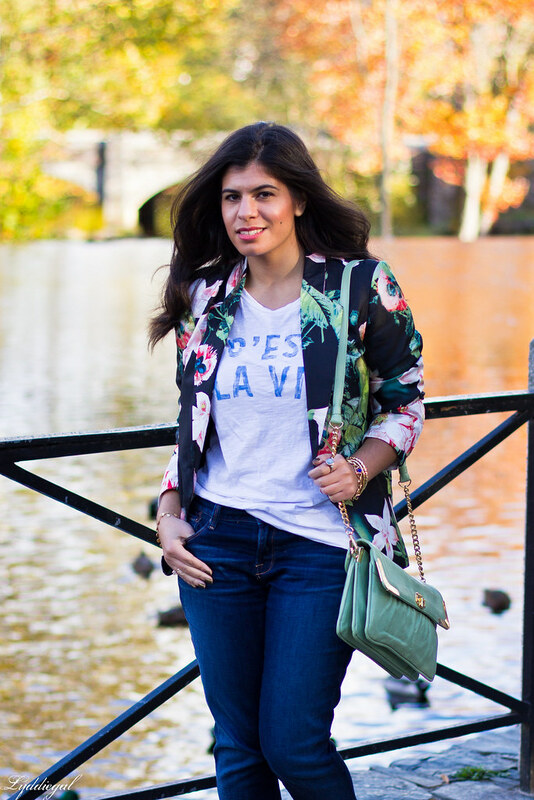 That floral jacket and the screen tee makes a perfect weekend look combo. You look great! 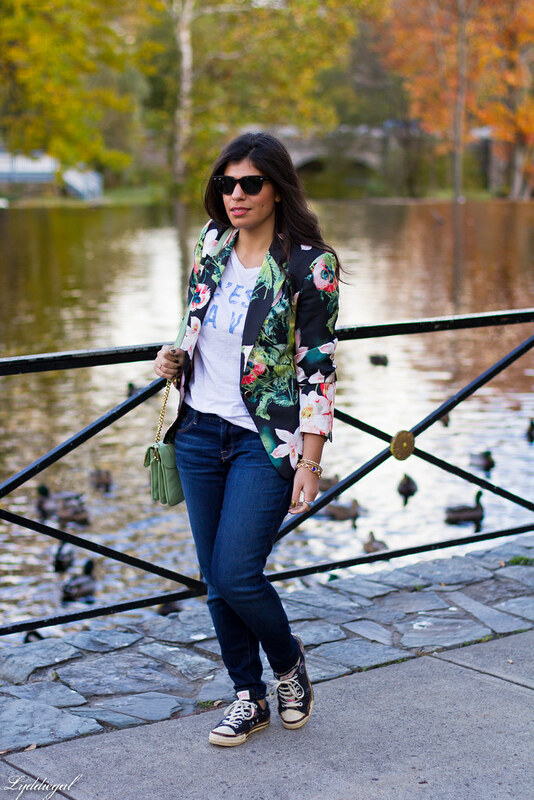 I love how you styled this floral blazer and those jeans look great on you! 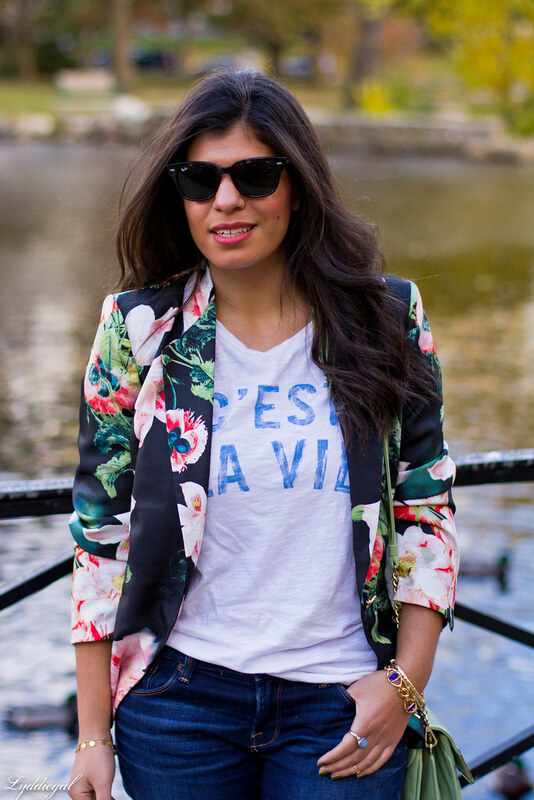 LOVE the mix of this floral blazer + graphic tee! Looking great :) Have an amazing weekend! but, there's always room for improvement. That's such a great blazer. Super pretty your blazer and cool combo. I think they look really good the way they are! Love the way you styled them. It's nice to see sneakers worn in such a cute and chic way! It's fun to be able to wear jeans for a long time-- love that you altered them! And your accessories are gorgeous. Have a great weekend! A great pair of jeans are so hard to come by--these must totally be worth it :) You look great! Oh the quest for the perfect pair of jeans. I think they look great! I'm in love with lo ve with your blazer, it's perfect!!!! The jeans look great on you and super cute blazer. Have a great weekend. 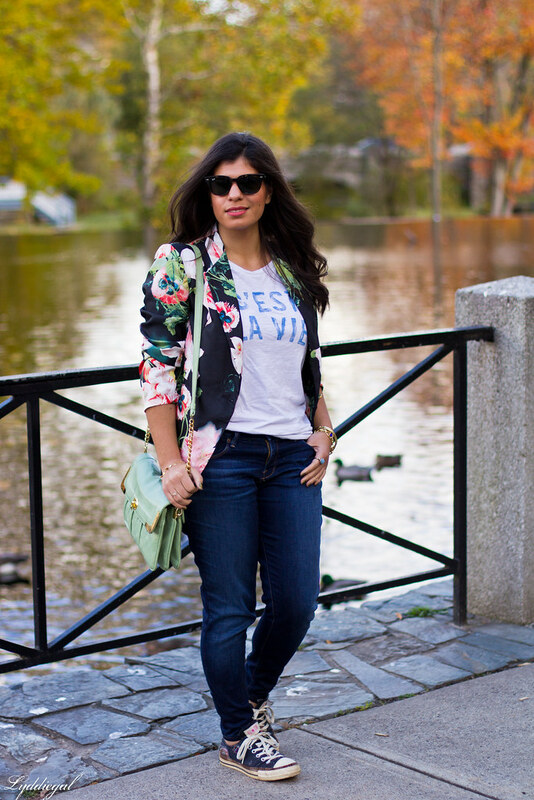 That floral blazer is perfect with this chic casual look! Love! Have a great weekend! That floral blazer is AMAZING! Love the blazer!! I've had the same issue with jeans. I either end up with denim that stretches too much or has no stretch at all. I have yet to find that happy medium that makes me want to buy a denim pant in every color available. Those are looking good though. I wouldn't go shorter, then you'd lose the option to cuff them. I always have to shorten my jeans! I like the length on these, I think they look great! I also love your blazer and tshirt. Such a great combo! You are way more persistent than I am with alterations. It's amazing how much difference it can make. 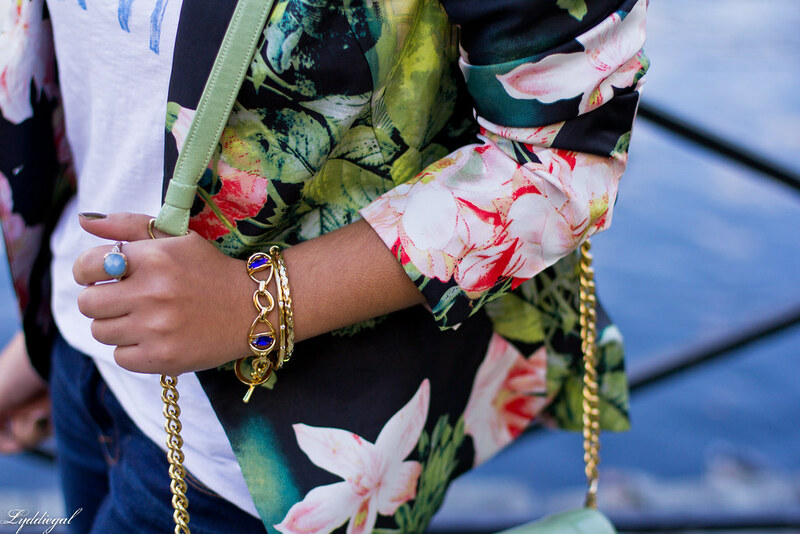 Love the floral blazer. You are definitely more patient than I when it comes to tailoring- if it doesn't come out right the first time, I'm more likely to give up! Ha. I love the bit of slouch here, and that blazer is awesome! Such a cool floral print. What an amazing blazer! I love it with the graphic tee! 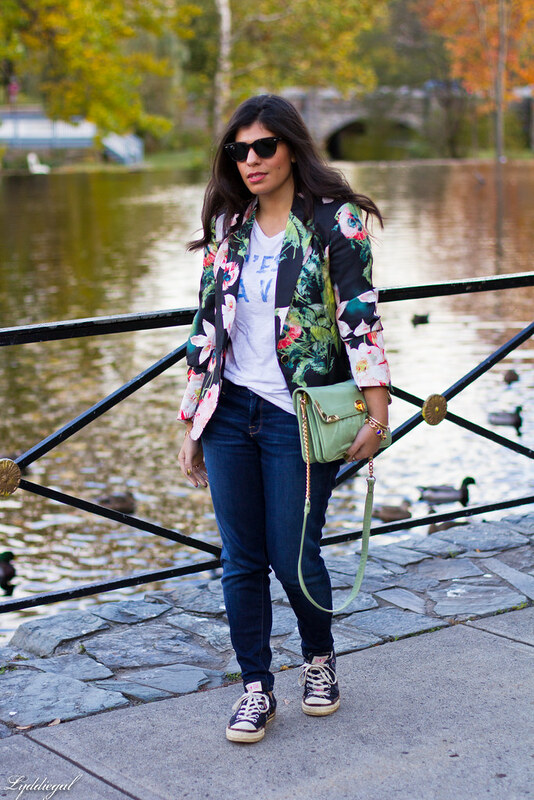 I love this casual look, the floral blazer is a beautiful touch! I love the graphic tee. This is a great look! The blazer and bag are my favorite parts. 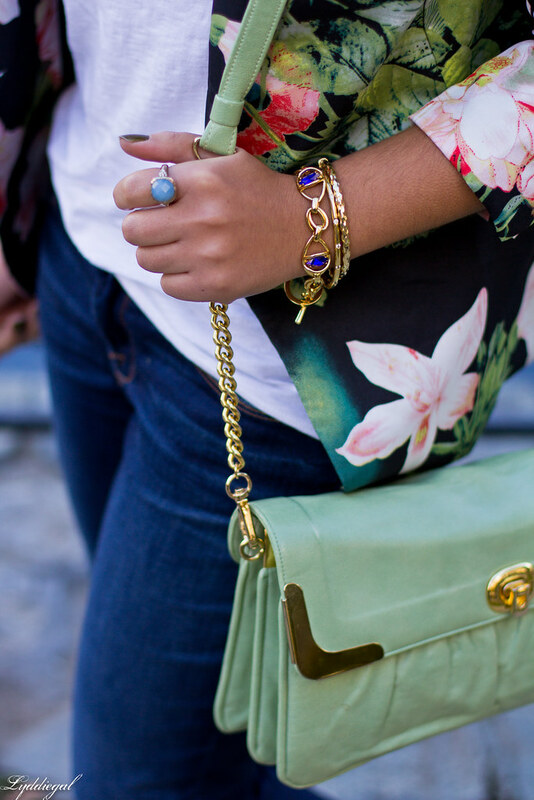 I love the print of the blazer and the color of the bag. What a great setting for your photos! I bought a new sewing machine last year but I am so nervous about sewing denim. I have the correct heavy duty needles, but I have had them snap with my old machine. I have few pairs that I could bring in. I hate that stupid stretching that happens with jeans. You can only wash and dry so much. I'm so impressed that you can make those changes to your jeans yourself! I wish I had those sewing skills! I love that floral blazer with that tee too. Goodness, that's dedication! It's so satisfying to alter an item to make it your own, especially when it's too comfy to give up! I love the OASAP blazer and it reminds me of my H&M blazer. I hope you had a good weekend dear! I love flowered blazers!! Beautiful outfit and jewellery too!